There has been a spate of articles about time recently, many of which seek to encapsulate social and cultural changes through abstract conceptions of time. Time is an immeasurable topic to attempt to talk about. On the one hand, it has been discussed by so many disciplines, from so many perspectives; on the other, less visibly it forms how we semiotically engage in discourse on a daily basis. From a socio-cultural perspective, the cultural production of all meaning occurs across dialectical and systematic dimensions of space-and-time. When we think of how time changes meaning, it is either synchronic (occurring at the same time) or diachronic (changing over time). I’ve been interested in some of the dominant and residual ways that we talk about time – in that how we talk about time is a bellwether to our changing relationship with time today. The focus here is to limit this discussion to ‘time running out’; the current western obsession with being busy, time poor and always struggling to meet deadlines. While an opaque mantra of modern life is the pursuit of work/life balance, this can be contrasted to the very modern obsession on time running out; with the demands of modernity taxing even the most reasonable of lifestyles. A pervasive literary evocation of the fear missing a deadline is that of the White Rabbit. 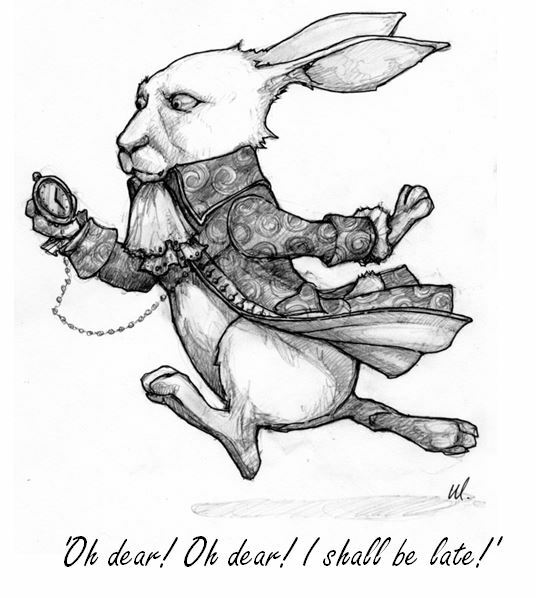 The White Rabbit racing against the hands of the clock, with his head literally on the line. Lewis Carroll started his story of a young girl’s journey to adulthood; with the juxtaposition of the effect of time on the nervous and elderly rabbit, against the exuberant and innocent youth of Alice starting her life’s journey. 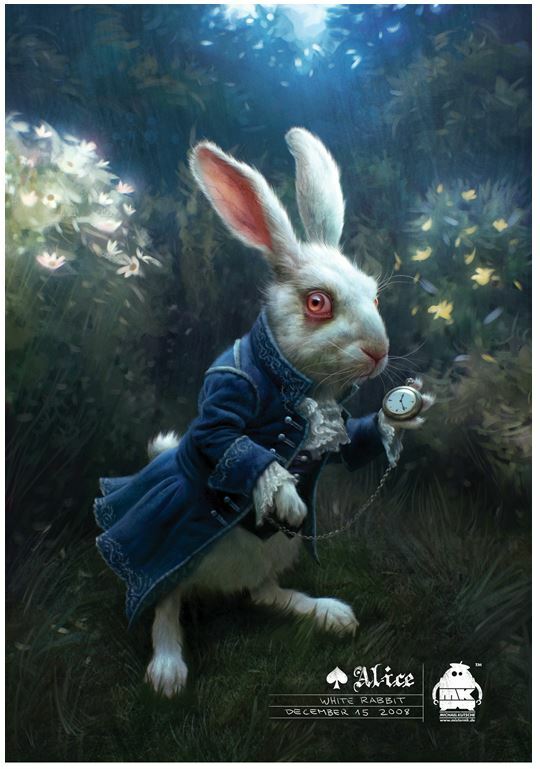 The white rabbit in many ways is a metaphor for the modern bureaucrat worn down by time and the relentless pressure of time. In contemporary society, people don’t generally believe they are busier than the preceding generation, they believe they are ‘constantly on’ and connected to others across more parts of their lives; and that the world itself is moving faster. If we think about the difference of Pre-WW1 life, 90% of the population had an income that came from agriculture; in the following years this situation has reversed with explosions in urban living. Live has moved from the seasonal clock of agriculture to measuring our days by the movement of seconds. Time is a notoriously difficult concept to understand. The modern understanding of time is almost always anchored in the present, past and future. It is perhaps relevant here to draw the distinctions and meaning present in ‘time’ in the two ways that early Greek philosophy perceived time. Time can be understood as an all-encompassing concept (synchronic) versus a more segmented and differentiated concept (diachronic) conception, fit into the standard discourse of modern society and culture. Current society understands the Chronos model – the causal relation of different modes of time, rather than perceiving time as an interrelated constant. Science fiction, as always, often explores these deeper concepts in easier ways. In Star Trek DS9, Captain Sisko tries to explain our perception of time against a race of aliens that live in an Aion conception of time where they perceive all time simultaneously. Time is a precious resource – it is a currency ‘every moment is precious ‘or a gift to be savoured’ or ‘spend your time wisely’, ‘don’t have the time to give you’, ‘you are wasting my time’, ‘invested a lot of time in the project’, etc. Time is movement – it is a river or stream we need to navigate, but also that time is something we move through, like water, through our lifetime; it is like an arrow that has been released and can’t be stopped; ‘time flies; it is a race where you are constantly running against the clock; time goes by fast. Time is a thread – representing the linear nature of time, also the idea that fate spins these threads of destiny. Time is a predator – like the Hobbit riddle above; is a devouring relentless force, also expressed that time is a storm that is destructive; alternatively, time is a thief and takes life from you. Time is fleeting – it’s a moment, there is only the now, the present moment. Time is a prison or trap – not being able to escape from the present. Time has a horizon – it has a past, present and ending, ‘the end of days’. 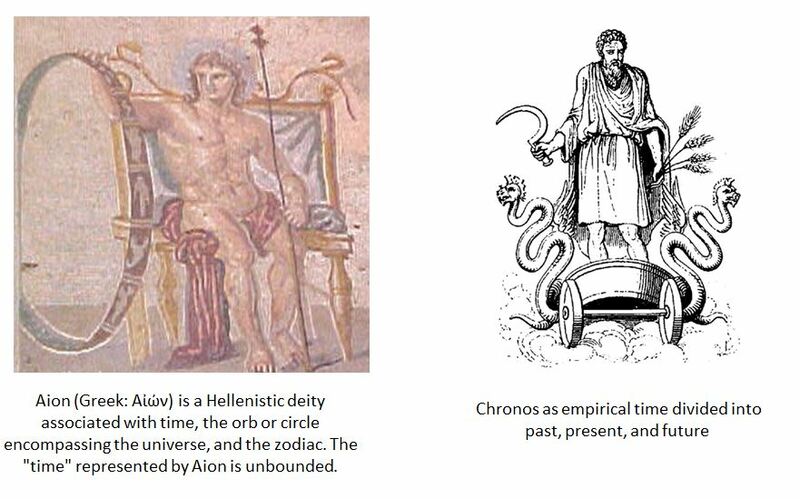 Since we tend to think of time from the perspective of Chronos and not Aion, this involves perspectives of space and time: ‘Future times are in front of the observer, past times are behind the observer’ and ‘One thing is moving, the other is stationary; the stationary thing is the deictic center’. From a cultural level, it’s important to clarify that these examples are representative of English metaphors and there are cultural differences. For example, time is a horizontal concept in English, whereas in Chinese, time is considered a vertical concept. Although, across different languages a constant is that time is conceptualised as being one-dimensional, such as ahead/behind or up/down, rather than in multi-dimensional or symmetric terms such as shallow/deep or left-right. there are many aspects of our concept of time that are not observable in the world. 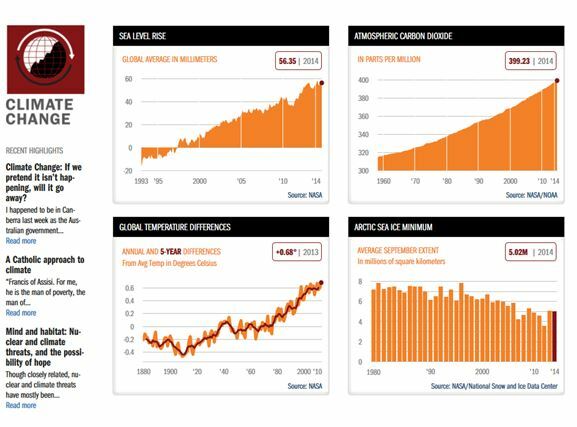 we are looking forward to a brighter tomorrow, falling behind schedule, or proposing theories ahead of our time, we are relying on spatial terms to talk about time. used as easily as temporal schemas to organize events in time… It appears that abstract domains such as time are indeed shaped by metaphorical mappings from more concrete and experiential domains such as space’. Modern societies are therefore by definition societies of constant, rapid, and permanent change. This is the principal distinction between “traditional” and “modern” societies. Modernity, by contrast, is not only defined as the experience of living with rapid, extensive, and continuous change, but is a highly reflexive form of life …. A hypothesis is that in the modern world we perceive time as a precious resource that runs out too quickly. There is a consistent analogy between the human span of years and the hourglass, from the ancient Egyptians to daytime USA pulp culture. Thinking that a precious resource is running out, frames your mind to focus on what you are losing, not on what you are gaining. It’s worth taking a moment to pause, to think of the impact of time as experienced through our biology. We might think of time through metaphors but is George Lakoff correct in saying that we do not have receptors for time? Circadian rhythms are physical, mental and behavioural changes that follow a roughly 24-hour cycle, responding primarily to light and darkness in an organism’s environment. They are found in most living things, including animals, plants and many tiny microbes. The study of circadian rhythms is called chronobiology. “We know that clocks exist in all our cells; they’re hard-wired into the cell. Imagine what we’d be like without a clock to guide us through our days. The cell would be in the same position if it didn’t have a clock to coordinate its daily activities. Joseph Campbell, in discussing the mythology of time, noted that a healthy resting heart beat is 60 beats a minute – one beat a second. He was suggesting that our bodies are influential in how we conceptualise time. We think through time experientially through space as an interrelated metaphor, but the experience of time appears to be fundamental to our DNA. An observation made at the beginning of this article is that our era is characterised by a perception that we are not busier than other generations, but that life is moving at a faster pace. This is driven by a whole range of factors (explored in some of my other blog posts), but technology is a significant factor here. Losing just 30 minutes of sleep a day could lead to life-shortening obesity and Type-2 diabetes: ‘people who lose 30 minutes of sleep every night during the week are 72 per cent more likely to become obese and suffer related health problems’. The health effects of sleep aren’t just about how much of it we get but also about when we get it. And a more evening-driven schedule, the researchers found, could be less healthy than a morning one. Our understanding of the role of sleep is only starting to be understood in terms of its full implication for physical and psychological wellbeing. The molecular clock is perceived as an essential tool for the study of evolutionary biology, molecular ecology and conservation genetics. The molecular clock works as a conceptual hypothesis for estimating evolutionary timescales – rather than being something that is ticking. The Cosmic Calendar is a method to visualize the vast history of the universe in which its 13.8 billion year lifetime is condensed down into a single year. You can see Carl Sagan explain its purpose directly, from the past. From a cultural perspective, most western cultures were wrapped up in millennialism in one form or the other in the year 2000. This milestone number in the year 1000, 2000 and no doubt 3000 evokes a lot of spiritual projection. In the year 999AD, there was a belief that a ‘Golden age’ or ‘Paradise’ would start from start from the commencement of the next era? a religious belief was driven by Revelation 20:1-6. 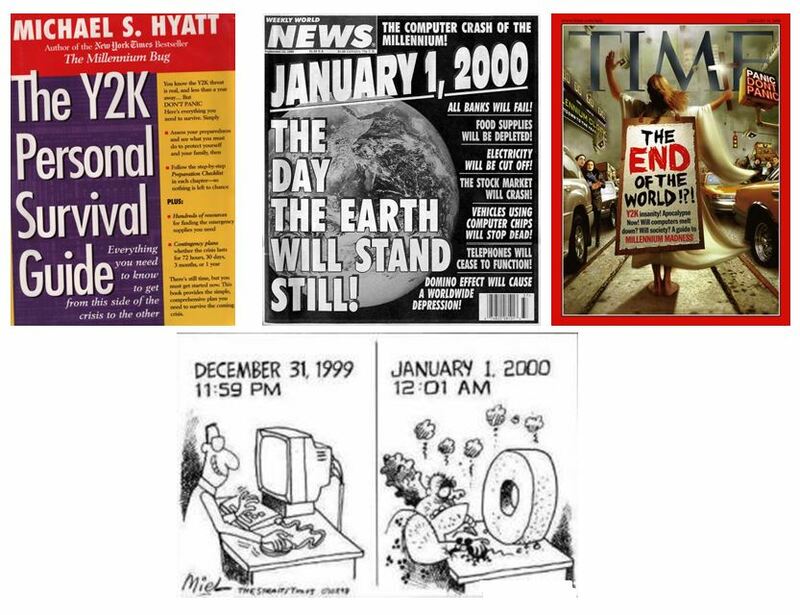 For the more secular world, this sense of something important happening with our calendars’ milestone was encapsulated in the hysteria around Y2K. After years of dismissing cults with their doomsday predictions, the world blinked and bought into a myth that a computer-bug about time coding could take away their technology. 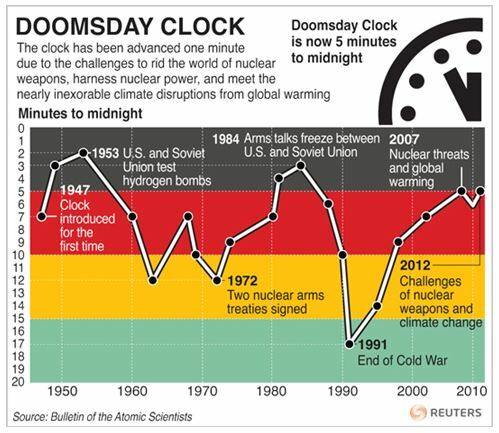 More recently, the embers were fanned when clocks will get an extra second on June 30, 2015 to account for the fact that it is taking the Earth longer and longer to complete one full turn—a day—or, technically, a solar day. Even though this has occurred 25 times since 1972. 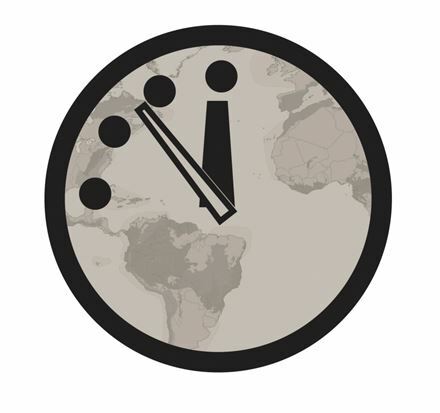 The clock illustrates a countdown to possible global catastrophe (e.g. 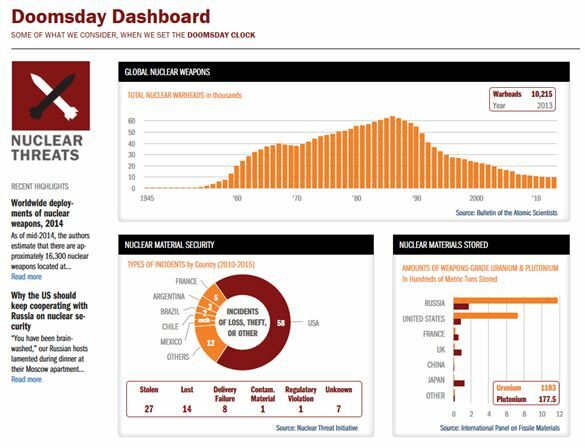 nuclear war or climate change). It has been maintained since 1947 by the members of the Science and Security Board of the Bulletin of the Atomic Scientists. Perhaps to revisit the allegory of the White Rabbit, his stress was created by the technology that he was carrying with him. His understanding of time was directly due to his need to keep running and monitor his every step of his journey with his pocket watch, perhaps a prophetic vision of how many of us live our lives. This is from the way we understand our movements through a day but also in how we measure more abstract concepts such as the Doomsday threat. 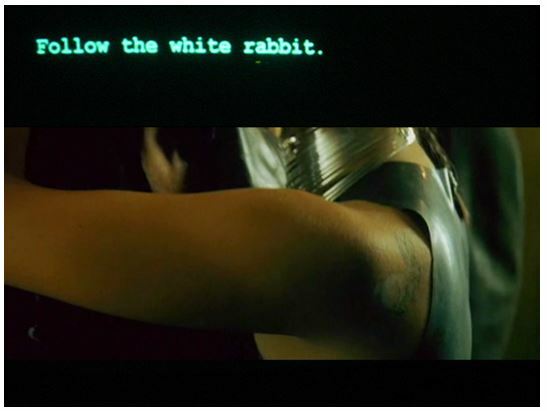 Ironically in the Matrix, a dystopian ‘contemporary’ world where technology is the bane of humankind’s existence, it is the White Rabbit that offers Neo his first step to understanding and ultimately leaving the Matrix. Especially if you read the last panel from the Doomsday Panel Analysis above ‘Preparing for more cyber conflict’ and ‘the killer robot problem’. Increasingly, every minute of the day, plotted in cloud-based calendars and prompted to action by our smart phones. These devices are now merging to a new form of enumeration of our active/time through the quantification-of-self innovations. As an experiment, I spent a few days asking people politely for the time. This seemed to confuse many who were incredulous that I wouldn’t have a watch or a mobile. The second observation is that more than three-quarters of the people read the time from their phones, not from a watch. The question is whether the watch hands measure time or now only represent our need to keep moving.